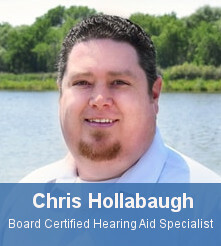 Chris Hollabaugh is a Board Certified Hearing Instrument Specialist with 8 years of experience working with the hearing impaired and hearing aids. Sound is his passion! He truly enjoys helping people hear better and projects a positive and encouraging attitude to each patient he works with. With a background in Audio Engineering, he has a unique talent for working with musicians to improve their hearing with both speech and music. He is always excited to meet new patients and find out how he can help them reconnect with the world around them.